Poverty, crime, corruption and political instability are testing the EU-aspiring country. 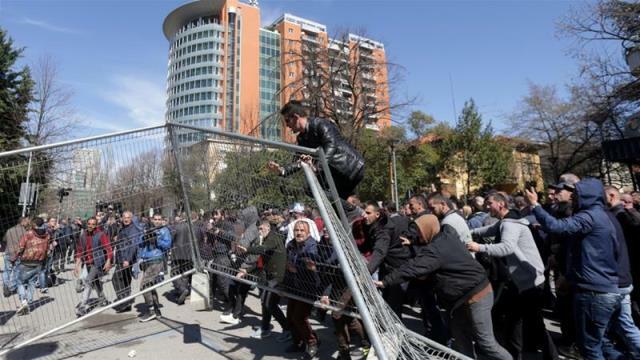 Political divisions are deepening in Albania as the opposition steps up demonstrations against the Socialist government of Prime Minister Edi Rama, which it accuses of using drug money to control the country. The opposition Democratic Party left parliament last month and began a series of protests outside Rama’s office. On Thursday, it is inaugurating a new practice of demonstrating outside Parliament every time there is a debate. The perception that Edi Rama’s socialist government has embraced special interests, and especially the illegal drug trade, is widespread in Albania. Two interior ministers have resigned under suspicion of taking bribes from organised crime. Democratic Party leader Lulzim Basha believes the Socialists have used drug money to buy votes and party leaders and organised crime have effected “state capture” – complete control of the executive, the legislature and the judiciary, which does not pursue high-profile corruption cases. He is calling on Rama to step down and allow a transitional government to pave the way for an early general election in the autumn. The opposition said it stopped working in the legislature because it was essentially ignored. “Amendments we proposed were voted down without discussion. Whenever ministers were called to report before parliamentary commissions, they declined,” Basha told Al Jazeera. He said investigative committees didn’t work either “because contrary to the law they (the Socialist Party) refused to submit evidence of investigations we initiated of collusion between organised crime and senior ministers”. Basha has said the government rigged the 2017 election that re-elected Rama. The Organisation for Security and Co-operation in Europe (OSCE), which helps monitor Albanian elections, said there had been signs of voter intimidation, double ballot-casting and fraud in the vote. But all parties accepted the result and the European Union did not question it. “Why are they complaining about vote-rigging two years later, and just before local elections?” said Socialist chief whip Taulant Balla and urged the opposition to return to Parliament. The political turmoil comes as the EU is to announce whether it will start membership talks with Albania in June. A key criterion is whether Rama’s government will complete a judicial reform to root out corrupt judges and provide a balance to executive power. Even the European Commission, which supports opening talks now, makes this conditional on judicial reforms that will put more serious criminals in jail, especially those involved in the drug trade. “Albania remains the main source of cannabis herb trafficked to the European Union,” and, “is also considered a transit country for hard drugs such as heroin and cocaine,” the Commission’s latest report said. “While there is an increasing number of offenders being arrested for drug trafficking, the number of final convictions remains negligible,” it said. If anything, crime figures suggest that the drug problem is worsening. Four years ago, more than half of serious crimes related to the production and cultivation of narcotics. That rose to two-thirds in 2016 and almost three quarters in 2017. Judicial reform was one of the campaign issues that propelled Rama to victory in 2013, but he did not seriously address it for several years. Balla said, in 2016, the Socialists ended a practice that allowed politicians to appoint judges “who will investigate and imprison politicians. So, there is no control from Parliament or the government over the justice system,” he said. A key part of the Socialist’s reform was checking judges’ wealth against earnings. At least 17 senior judges did not pass the test. Some resigned when they received their summons to the vetting committee. This has left Albania without a functioning Constitutional Court or a Supreme Court. Even though the Socialists vow to rectify this by June, some question whether the delay was deliberate, as it gave the government a year-long window of unchallenged rule. During this time, it has issued executive orders without parliamentary or presidential approval. The most controversial of these placed 137 hectares of prime beachfront property under eminent domain, allowing the government to expropriate it for a fraction of its estimated $800m-$1.5bn value. The government says it is verifying the titles of hundreds of owners, mostly ethnic Greeks, who have come forth. Their legal challenges remain stuck in the semi-functional court system. But in the meantime, the government has started handing the land to contractors. “Our main challenge remains the development of tourism,” said Balla. “Big companies, from Germany, from Italy … cannot come to invest in Albania [if] they are not guaranteed property titles,” he said. Basha said this is another example of the partisan economy. In June, the Socialists also face a test of their popularity in local elections. They are plowing public money into large infrastructure works including roads, schools and hospitals. But there are signs that these are failing to impress people who cannot find a job. Official unemployment stands at 13 percent despite four-percent growth on paper. Per capita earnings, at under $5,000 a year, stand at 29 percent of the EU average. Albanians who went abroad send $1.25bn home in remittances – 10 percent of GDP – and many more are trying to leave, legally or illegally, rather than remain in a job market they consider politically slanted. Factional capture of the economy is not unique to Albania. If anything, it is the Balkan norm, ensuring that at any given moment, at least half of society suffers from discrimination by the state and by private interests under state pressure. But the Socialist Party may have breached the tacit understanding that it will not entirely disenfranchise the opposition economically and politically. All parties support EU membership, but they are divided on Albania’s chances of success. “We know the EU will not open negotiations with a country that many European media call ‘the Colombia of Europe,'” says Basha.